when I returned home from last weekend's jaunt to dc waiting for me was a wee alice from susan of artspark theatre. last month susan mentioned that she would send 10 alices to interested friends in the bloggyhood. shockingly, I actually got a comment posted in time. susan intends to send out another batch of alices in early august; by now they probably are already spoken for - but who knows how long susan will continue this wonderful project of populating cities and towns with the adventurous alice! A fragrant saison blended with coriander, lemon balm, chamomile and lemon basil, some of which were sustainably grown on our "Pint Size Farm" at Hale Farm & Village. An American Red Ale with crisp hop flavor. it can be difficult to choose what beer to try at glbc, they has so many good ones! I noticed quite a few folks went with flights of beer where they get a assortment of various brews. if interested go here to see other snaps of alice on her first of hopefully many cleveland adventures. Well, while listening to White Rabbit (and why can't I pass up an opportunity to do that, ever, no matter how many years pass? And why can't I listen, ever, without singing along, even with earphones on? )....while listening, I had a peek at ArtSpark Theatre. Beautiful site, isn't it? Your Alice is lovely, though she may want to give that pig a wide berth, 'cause it's a whole lot bigger than she is! A most handsome pig, indeed. Good thing he wasn't along for the rest of the adventure or he would have snarfed down all your beer. Yours sounds yummy, I'll have to check out that list. Jefferson Airplane:What a voice that girl had - a solid wall of sound. Best. Have a great 4th. Super cool. Enjoy Cleveland, Alice, and a happy holiday weekend to the Mouse House! What fun-- I love ArtSpark Theatre too, it's a trip in its own way. Great placement of Alice! I was a big Jefferson airplane fan. Have a good 4th, my friend. glad to see susan's story continuing over here. thanks for a great post and a fav song from the past. happy 4th. This is such a great idea! I need to sign up for my set, and I hope to eventually meet Susan. Her work is so wonderful. That grassroots ale sounds terrific! 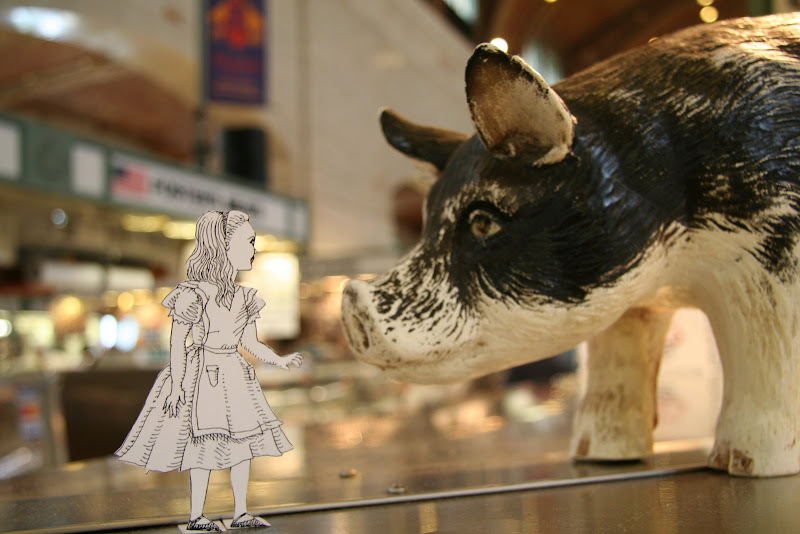 And what a wonderful pig hanging out with Alice. Great posting. Happy weekend, Mouse! The picture is just lovely! I tagged you on my blog. Come and collect your award because I find your blog...awesome! I love seeing Alice in new situations! One pill makes you larger and one pill makes you small..... I loved listening to this again. And Alice next to the big snout made me laugh. Found my way here through Art-spark-theatre. A very interesting photoblog you have here - full of wit, whimsy and wisdom. hope everyone had a good 4th weekend - alice did! and it was a very friendly pig! rlb - saw that another alice was having a good time in graulhet and almost went down another rabbit hole! nice to see how many of us enjoy listening to white rabbit ....another song that is downright addictive! junk - I hope you get an alice to take around the mission and to introduce to hello kitty and ms. bow. welcome jasmine and justdoodleit - thanks for visiting the mouse! THIS IS THE FIRST TIME I HAVE SEEN THIS BLOG. I USUALLY VISIT THE DP ONE. MIGHT I SAY, THIS IS EXCEPTIONAL. I HAVE READ THROUGH IT IN CONJUNCTION WITH THE PHOTO;VERY, VERY WELL DONE! I remember as a teen I read the book "Go Ask Alice" by Anonymous. It certainly scared me off of ever doing drugs.s The song has such a haunting qulaity to it. Grace Slick had such an excellent voice.